Japan in general, and Nikon in particular, was already a significant player before the "SLR Era"; but it was the 1959 Nikon F that created the SLR Era by proving that a Single Lens Reflex, if it was designed and built well enough, could outperform the best rangefinders. With control layout based on the established Nikon S series of rangefinder cameras, the F took the state of the art and pushed it forward: bright, interchangeable viewfinders and screens, interchangeable coupled meters, instant return mirror, full lens automation, high performance motor drives, and above all, ruggedness and reliability at a level never before seen in an SLR. The camera handled as well as a rangefinder and was just as tough, with all of the added versatility that the SLR viewing system had to offer. Not only rangefinders, but the existing generation of top-level SLRs, were instantly doomed to extinction. There were Japanese SLRs before the Nikon, but this is the camera that made the SLR and the Japanese camera industry what it is today. Nikon had a harder time translating their professional-level excellence into a product for the amateur market. 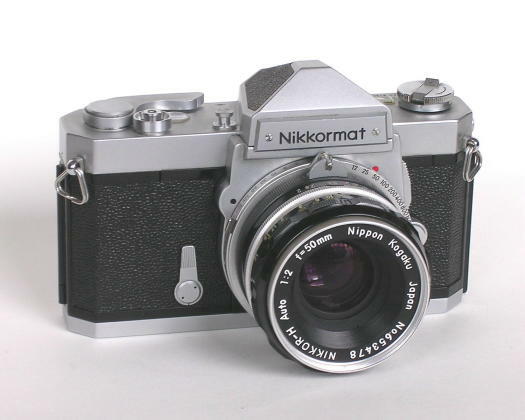 After a number of false starts and half-successes under the Nikkorex name, they finally hit the magic formula with the Nikkormat FT in 1965. Combining the quality construction and feel, and many of the features of the Nikon with the addition of a TTL light meter, the Nikkormat was an immediate success and has proven itself to be the Nikon's equal in durability and performance. My father bought this camera new in 1966; it was his first Japanese camera, and he never bought another one from Germany afterwards. I suspect he was just one of many who reacted similarly. Staying with the Nikon theme, the Nikkormat evolved into the FM, the FM2 and finally the FM3A which is currently in production. 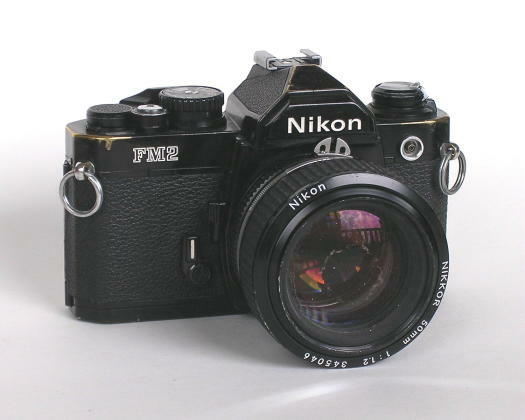 I obtained this FM2N as parts for $5 and rebuilt it with another $27 worth of parts from Nikon. The 50/1.2 AIS lens mounted on it was also obtained as parts, left over after I combined all of the best parts of two lenses to make one good one. Even though this lens is composed almost entirely of damaged parts (note the prominent coating damage on the front element), it is surprisingly sharp and contrasty, and except for its bulk and weight is one of my favorite lenses. Canon had been Nikon's main rival in the 1950s, but fell behind in the SLR competition of the 1960s. The Canon F1 of 1970 marked the company's return to the front rank, and a line of very competitive cameras followed. 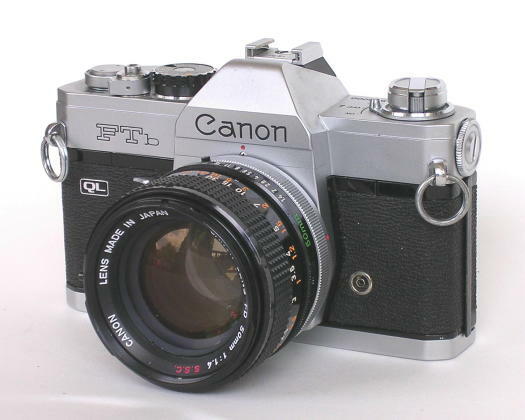 This FTb of the early 1970s was Canon's answer to the Nikkormat. Its quality was comparable, handling was a bit more conventional and convenient, and Canon's optics, as always, were second to none. 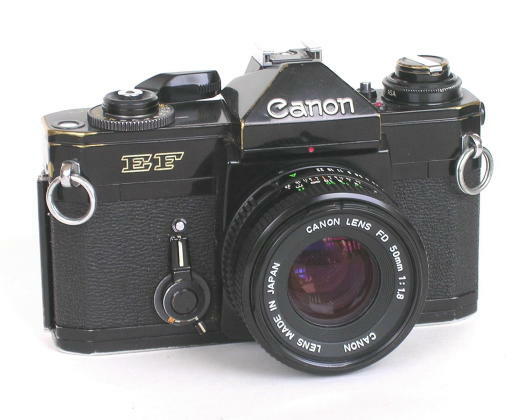 Not long after the FTb came the Canon EF, one of the very first great autoexposure cameras. The EF had a composite mechanical/electronic shutter giving speeds as long as 30 seconds and still providing all speeds from 1/2 second up without batteries. Unlike some contemporary cameras, the EF's electronics were very robust, as was the rest of the camera; its only down side was its cost, which was high even by the standards of automatics in the early 1970s, and it was replaced after a few years by the lesser, but much cheaper, A series. Not long after Canon rejoined the top ranks with their F1, Olympus introduced the first of a series of cameras that would change the rules of the market for the next decade. The OM1, at left, combined a full system of lenses, motor drives, interchangeable backs and screens in a tough, reliable camera that was substantially smaller, lighter and quieter than anything else on the market. 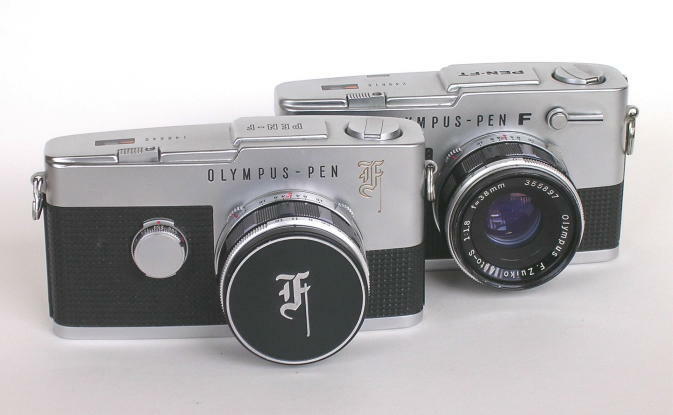 Instantly, Olympus was one of the Big Three, and other makers scrambled to produce smaller, lighter designs to compete. 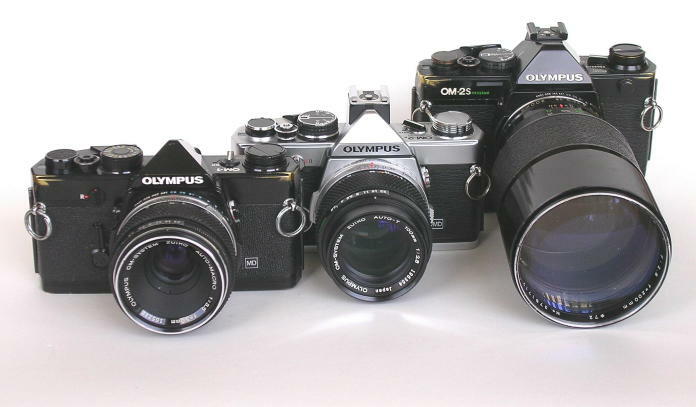 In 1976, the OM2 (center) was introduced, adding Off-The-Film metering and TTL flash control for the first time without increasing the size or weight of the camera over the OM1. Better still, all OM1 lenses, motors, backs and screens fit the OM2. And finally (after advancing on the OM1 and OM2 with the OM3 and 4, respectively), the OM2S was introduced in the early 1980s adding spot metering and Program automation.... and all OM1 lenses, motors, backs and screens STILL worked with all features of the camera: the most seamless, integrated system ever created for a 35mm SLR. Unfortunately, the autofocus boom of the 1980s sank Olympus as a top line player, and they are just now beginning their comeback with the digital E1 system. 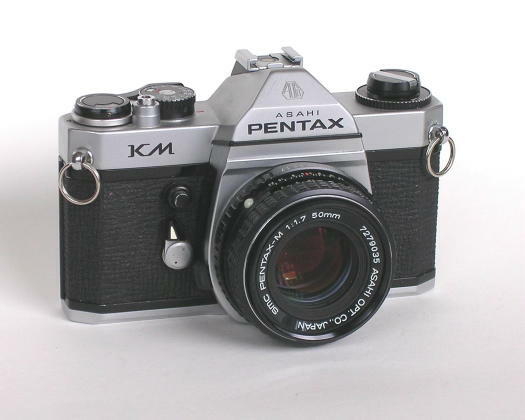 There were a few companies in Japan making SLRs before the introduction of the Nikon; Pentax was one. Having given the world its first instant return mirror in the 1954 Asahiflex, and its first TTL metering in the Spotmatic, the company deserves credit along with the Exakta (the first 35mm SLR), the Contax S (which introduced the pentaprism) and Praktina (which gave us internal lens automation) for its share in the evolution of SLR design. This Honeywell Pentax H1a (Honeywell was the US importer) dates from the early 1960s and was among the last of the meterless Pentaxes before the Spotmatic introduced TTL metering in 1963. 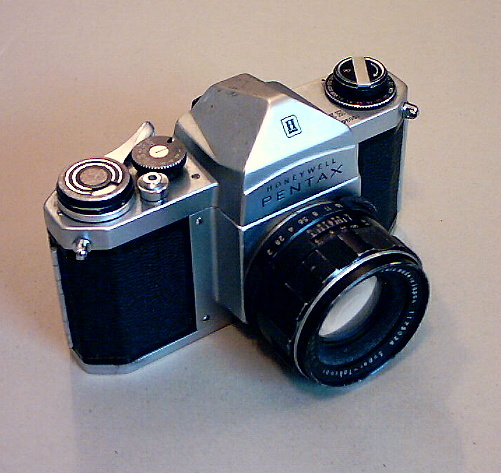 The Pentax adopted the M42 screw lens mount from the Contax S, and even the name "Pentax" was licensed from Zeiss Ikon VEB after the latter chose to use the name "Pentacon" instead. While Nikon and Canon battled above, the Pentax's main competition for the larger, middle-range Serious Amateur market came from Minolta. 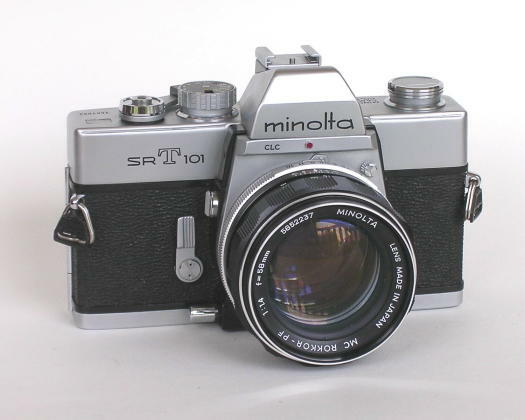 Minolta SLRs date back to the late 1950s, but they really struck gold with the SRT-101 in 1969. 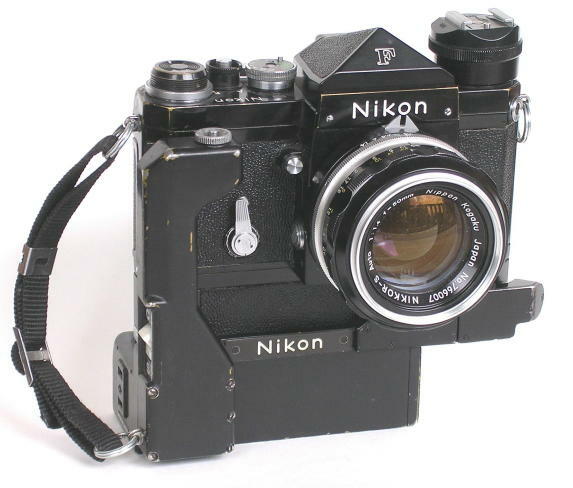 Minolta's first camera with TTL metering, it required a revised lens mount which was (nearly a decade later) copied by Nikon to create their "AI" system. The SRT's meter incorporated a dual cell arrangement to detect high contrast scenes and automatically correct for backlighting, and its controls operated with a silky smoothness that rivaled Olympus. Plentiful and an incredible bargain today, a good SRT can often be had for under $50; I paid $15 for this one with its f/1.4 lens and case. 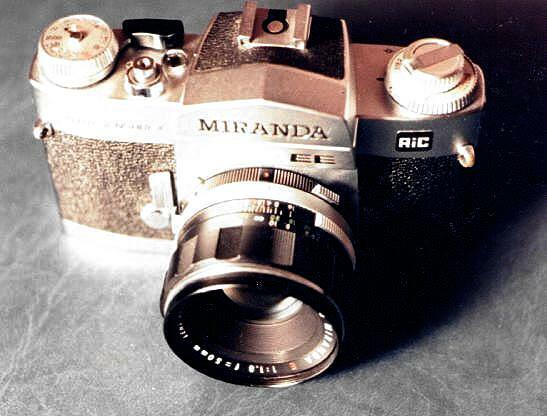 Another company that preceded Nikon in the SLR field was Miranda. Beginning in the mid-1950s, the Miranda featured a shallow body and a large 44mm diameter lens mount that permitted lenses from Exaktas and Pentacons (ie, all existing 35mm SLR systems) to be used with available adapters. The Miranda mount was also unique in that it incorporated both an outer bayonet and an inner screw thread, combining quick handling with a convenient, simple interface for mounting accessories. There were two basic Miranda series, both based on the same body: the smaller series began with the Model T and then progressed from A through G; then a TTL meter was added and it became the Sensomat, of which all three generations are shown here. The taller, deluxe Miranda line began in the early 1960s with the Automex, which had Miranda's first coupled light meter. The advent of TTL metering evolved this into the Sensorex, then the Sensorex II and finally the shutter-priority Auto Sensorex shown here. This was a good and convenient camera, adding automation and switchable spot/averaging metering to the Sensorex formula. All Mirandas up to this point featured interchangeable viewfinders; only the Model G had interchangeable screens and mirror lockup. 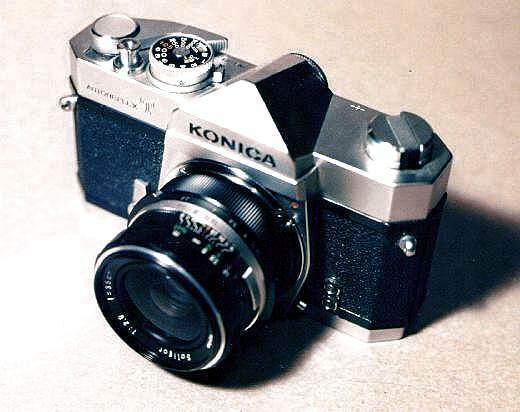 As in West Germany, the leaf shutter SLR concept had its adherents in Japan as well. While Nikon and Topcon both toyed with the idea, Kowa pursued it with focus and commitment. As a result, the later Kowa 35mm SLRs are among not only the most full-featured, but also the most reliable and repairable leaf shutter SLRs in the world. Lenses ranged from 28 to 200mm, of which only the 28mm is missing in this photograph, and the SETR and SETR2 featured TTL metering and instant return mirrors in addition to the broad choice of interchangeable lenses. The camera with the 35mm lens on it carries a property tag from its original owner, the Virginia Division of Forestry. It had been used so long and hard that one of the neck strap lugs had completely worn through and dropped the camera - but it still works.